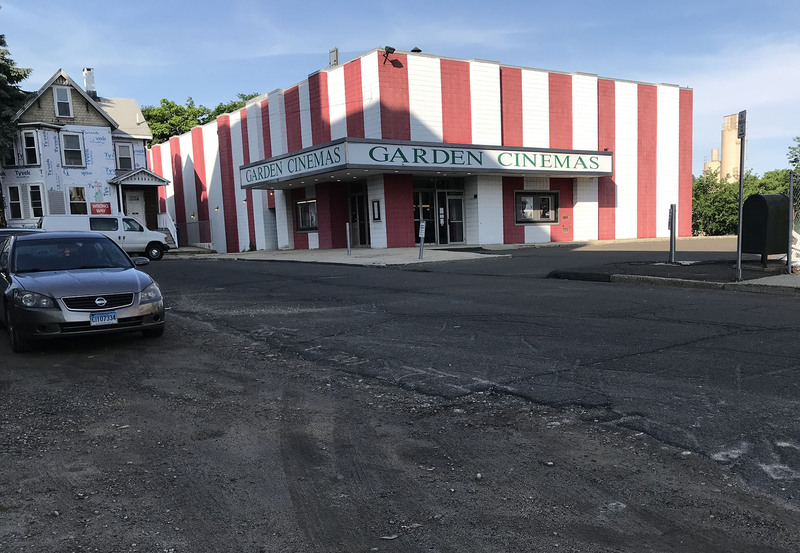 NORWALK, Conn. — A developer seeking to restart construction on Wall Street Place is attempting to buy the Garden Cinema on Isaac Street, according to Jason Milligan, a real estate broker who has bought a big chunk of “POKO” property. JHM Group, Citibank’s preferred developer, is seeking to solve a major problem for Citibank by acquiring the art house theater and using the property to provide parking for the stalled development, which is necessary before the project can move ahead, Milligan said. Richard Freedman, agent for Second Garden Development Limited, did not return a Thursday afternoon phone call from NancyOnNorwalk asking about Milligan’s claim. Wall Street Place, dubbed the “Tyvek Temple” by Milligan, has sat half-built since mid-2016, when construction stopped due to a budget gap. Developer Paxton Kinol has described the gap as $9 million. Citibank, which issued POKO Partners a $31 million construction loan for the project and has since taken ownership of the property, has been trying to restart construction. Wall Street Place is out of compliance with the Zoning regulations’ requirements for parking, a major obstacle for Citibank and JHM, according to Milligan. Citibank is up against a deadline: the $8.64 million in Low Income Housing Tax Credits (LIHTCs) awarded to Wall Street Place expire in November. The credits cannot be renewed without an approved project, Milligan said. “They are supposed to be ready to go, they are supposed to have approvals. They do not have even the slightest of approvals,” Milligan said. Milligan opined that there is no way that Citibank and JHM Group can meet the end-of-year deadline, given the approval process that would be necessary to change the Phase I plans to accommodate parking on a separate property. In addition to a Zoning Commission vote, a revised project would require changing the Land Disposition Agreement, which would have to go through several agencies, he said. Assistant to the Mayor Laoise King declined to comment. JHM Group is composed of father and son developers John and Todd McClutchy, who are said to be tight with Gov. Dannel Malloy. John McClutchy donated $165,000 to the CT Central State Democratic Committee by February 2015, according to Jim Cameron. Todd and John McClutchy, Janet McClutchy and JHM Group have donated a total of $32,500 this year, according to Open Secrets. The Zoning Commission in 2016 allowed POKO Partners to move some of the parking spaces planned for Phase I of the project onto Phase II. At the time, POKO owned Phase I and Phase II but now the properties for the two phases have different owners – because Milligan recently bought Phase II properties from Richard Olson of POKO Partners. Phase I therefore doesn’t have the parking required under the Zoning regulations. Milligan and Olson are being sued by the Redevelopment Agency and the City, which claim they needed Redevelopment Agency approval to make the transaction. King said late Thursday that she has no idea whether McClutchy is trying to buy the Garden Cinema. “What I do know is that Citibank will have to provide sufficient parking to comply with zoning for Phase I and to replace the public parking spaces previously located on that parcel. I understand the bank is exploring options to satisfy the parking requirements but no proposals have been presented yet,” she wrote. Any approval granted to Citibank could be challenged in court by neighboring property owners, which would hold the project up for years, Milligan said. Milligan in 2016 won Zoning approval for a 69-unit apartment building on the lot at 11 Belden Ave., only to face a legal challenge from the Norwalk Public Library Foundation. The suit was settled last year with the City agreeing to pay Milligan for a five-year option to buy the property. “Once you get approved at Zoning, if you get approved at Zoning, anybody who is an abutter has the ability to appeal. They are statutorily aggrieved,” Milligan said. The Norwalk Public Library Foundation wasn’t an abutter and was still allowed to appeal the Zoning Commission’s approval of his Belden Avenue project, he said. Nancy-Normally you are spot on. This time there are quite a few inaccuracies. #2 I do not pretend to know if CHFA will extend the tax credits for Wall St Place or not. I just know that they expire again in November. Ultimately the governor is the person who signs the tax credits. You, Tim Sheehan & others have publically demonstrated the close ties between JHM and the governor. #3 I did not state that neighbors would be aggrieved, but rather that they have standing to bring zoning appeals. The point about the library project was that a party that was not even a legal owner or abutter was able to bring an appeal without consequence. A year and a half of court and there was not even a chance to argue about the legal standing of the library foundation. There are more than a few neighbors that have been adversely affected by this failed project, and the inaction of the city. They clearly do have standing, and I would not be surprised if one or many would appeal any zoning approval that may be granted in the future, and appeals can take a long time to resolve. #4 My purchase did not lead to a parking shortage! Any shortage was created by POKO trying to save money. My parking lot is still a parking lot, and it will be for the foreseeable future. The Garden Cinema business has been decimated by the POKO failure and it is POKO that may swallow it up. SAD! I stand ready to work with the city to solve Wall st. Not one person from the City has ever been willing to discuss potential solutions. There are lots of ways to fix the area, and I am eager to be part of it. Instead, the city has filed a frivolous lawsuit that is wasting time and tax payer money! Clearly JHM knows how to “get things done” and political “donations” to Dan Malloy could never pass a smell test anywhere but Hartford. If anything The Garden Cinema undoing is directly related to the City of Norwalks inability to create a contingency plan while they waste our money sitting on the POKO disaster. The Garden Cinema is a rare gem in an otherwise failing area. First and foremost my wife and I love the Garden Cinemas. The place has seen better days and could use some major updating but i don’t see that happening without a major backer. With that being said if the owners want to sell who are we or the city to stop them from selling it? Why does this need to be a story? And why does parking always have to be brought up when there is a multilevel garage right across the street? When I lived in NYC during my 40’s a parking lot within that proximity from the location I was going to was a gift from God himself. Don’t look a gift horse in the mouth people. When we go to Ponto’s (Amazing jewel of Norwalk btw) we still have to wait for a table so obviously parking is not crushing their business. If your business is truly worth the price of admission people will come. Another point that’s been on my mind. The media and its followers have been painting this Milligan guy as a local legend for sticking it to the City of Norwalk. But if you read between the lines you will see whats really going on. Milligan is a young and smart guy who found a loophole that the city should have been wise to. He jumped on this loophole and took advantage of it which smart business men do. My issue is that in business you do this to other businessmen because its called business and at the end of the day we all know the city will pay Milligan more than what he paid for the property. Well guess where that money is going to come from? That’s right, your tax dollars!!!!!! So before you label Milligan as a hero with great intentions just remember who will be paying for his heroic efforts at the end of the day. US! Well played Mr. Milligan. @Sid Welker, I agree that having the Garden Cinema in Norwalk is great. I have seen and introduced my family to great independent films at the Garden Cinema, which spared me from having to go to New York. I love New York. I love the excitement, the conversations, the creativity, the people who seek to hone their skills, but I don’t often have the time to get there as much as I used to. I love the arts and I’m thankful to have The Westport Country Playhouse, The Avon, and Garden Cinema so close by. Who owns Garden Cinema isn’t my issue, or business unless it increases my taxes, but it would be nice to see whoever ends up with the company increase the level of its operation the way The Avon did in Stamford. I would put my time where my mouth is and wholeheartedly help with that effort. Mike the mall in Norwalk with plenty of free parking will shut the city down so whats your point? This is coming to Norwalk correct? AMC Theatres has signed on to open an 11 movie screen theater. The 45,000 square-foot theater — equipped with more than 1,000 recliners — is slated to open in late 2018 in the new wing on the Richmond Avenue side of the property, according to Mall management. ( they serve beer also wahoo!) they arer in a lot of former malls of GGP. GGP did a lot before they sold the mall so the new owners will dictate to the city and will probably ignore any LDA that was ever signed. So knocking down a true gem on wall st so one of Harry’s buddies can build more units is ok? Mike you need to understand most of the time someone is ahead in thought knowing its like the RDA only give info that helps the demise of our city. The Garden Cinema has no parking because of that huge unfinished bankrupt apartment building disaster – where the downtown parking lot use to be. People do not want to park in the parking garage. One good way to ruin a business. And I do not care that it is not state of the art – the Sono Cinema was in terrible condition and people went because they wanted to see the movies they showed. Enough with these apartments – now they want to build over a 100 unit near sono train. Where is all the water coming from for these buildings? And all the traffic it will add. Homeowners are footing the bill for all these extra people. @Sid Welker-What are you talking about and why do you hide behind a pseudonym? I have no intention or desire to sell any property I own to the city! I want the city to get out of the real estate business altogether. They should focus their efforts on cleaning up the rules and regulations. Let myself and other private individuals give the city of Norwalk what they desire & deserve instead of what a few overzealous if not crooked bureaucrats want. Well, the nay sayers and conspiracy theorists and mayor haters and progress repressors are quite active here today. How come no one mentions the development in SONO? Not a peep outta Nancy or Jason or the same old writers about the new giant Beinfield project https://www.thehour.com/news/article/Spinnaker-proposed-106-apartment-mixed-use-13181153.php that will raze a section of sono to create “continuity” to sono. Is it because they are so caught up in the Wall St mess, or complaining about malls or apartments or the absolutely most ridiculous freaking thing. Parking. Or is it because they only care about one section of Norwalk, where their financial interest lie? Really people. What the heck is wrong with your head and your legs. Rarely did I ever see the Isaac St parking lots (before poko) even half full, day or night, unless there was a really good movie playing. For crying out loud, I park on Main and Wall for $1 and walk to Fat Cat or Paella for dinner, then up to the wonderful Cafe Aroma for gelato then walk back and have a drink at Troupe. If Main/Wall lot is full there is plenty of free parallel parking on the Bunnell Bridge or omg there us a giant parking garage right there too. The walk to the Garden (or Wall St) theatre is less than 5 mins. I never feel the crime threats that the fear mongers recreate here. I actually discovered Cafe Aroma and a couple of other gems by walking instead of blindly driving by everything as we suburbanites have been trained to do thus making us lazy, disconnected and tending to complain if we can’t park at the door to where we are going… waaaaaa really people. Let’s grow up, throw away the egos and conspiracies and bad blood and let the buildings grow. Apartments bring people, livelihood, services, activity, business and arts to a neighborhood. Cars encourage isolation and pollution. Can we look to the future and not the past. I want a thriving Norwalk as do many of us, but lawsuits and trickery “from all sides” as has been said so famously and horribly is regress not progress. Sid- the Garden cinema may be out of date but that’s part of the charm and experience of seeing otherwise overlooked excellent movies. We love going there and would miss it terribly. @Paul. BRAVO. Best comment I’ve read on here in quite sometime. Blunt but to the point. Might go over like a fart in church but bravo for saying what needed to be said. As for me, let the record show that I would miss the Garden Cinema terribly as well. My statement that “if the owner wanted to sell it who are we to stop it” or “it needed some updating” doesn’t take away the fact that I’m against the leveling of it. But if it happened I’m not going to place blame on the city or developers. The owner of the cinema wasn’t forced at gun point to sell if it comes to that. He is of free will to do as he wants. @ Mr. Milligan I hide behind no pseudonym. Just because you cant find me on the world wide web doesn’t mean I’m not a real person with real thoughts. My name and statements are real. I’m just a retired businessman relocated from NC up here to spend the last couple of years with my grand kids. I rent an apartment in the area and enjoy surfing the web. I worked in NYC awhile back and lived in Greenwhich for a couple of years before moving to North Carolina to retire. But family brought me back here. I really like the direction Norwalk is heading. I may not like all of the cast and crew but the plot of the story is promising. I see the part you’ve taken and I know how it will play out. I should I say “pay out”. Sid-Glad to hear you are a real person, and that you are optimistic about Norwalk. I love Norwalk and I am also optimistic about its future, despite some leadership inadequacies & missteps. I am willing to engage with you or any serious person about how best to help Norwalk and more specifically the Wall st area. I am self employed and run a for profit enterprise, but I also care deeply for the area. I have chosen to operate my business in the Wall St area for the last decade, and I have been in business in Norwalk for almost 2 decades. Wall st is the center of the city and it has much room for improvement.I have chosen to focus my energy and investment into this area and only this area. With my full attention here hopefully I do a part to move the area in a positive direction. @Paul-I am not sure why you expect me to comment on other areas of the city. I am one man. I am not a journalist. I am a business owner and a concerned citizen with opinions. Happy to discuss fuirther with you. I am so tired of the “no place to park” mantra for Wall Street. There is a multi-level garage that is usually pretty empty, a medium sized surface parking lot, and a large surface lot on Wall and Main. All are within a 5-7 minute walk of anyplace you might want to go. Plus, there’s usually street parking. I wish there were more of parking problem – it would mean more business for the folks that are hanging on by their fingernails in that area. But, right now, that is not the case. Sid makes a lot of sense. I’ve discussed Jason M.’s allegations with Nancy. This report is accurate and we stand by it. @Paul: The Spinnaker proposal for SoNo has not yet been presented to the Zoning Commission. Nancy is aware of it and there will be future coverage. Paul in order to get the drop on the people who are organized to screw the taxpayer its best to not strike when the iron is hot. Maritime condos brought all kinds of troubles to the city , some of us sat in at the condos meetings on the condition of the building was only one topic. Beinfield did not bulld it to his defense but when it went up he should of paid more attention to it.Fixing it took more than cosmetic intervention. I do hope tho myself and others fit all the profiles you mentioned seems to be a club no one person can take credit for standing up for those who cant , unlike yourself it seems you haven’t been bitten yet. I would tho before the attack includes Nancy she has what we all refer to as an archive her work is out there a simple search even on Google shows some of her work. I would suggest to dig deeper if you want to take shots on those who help tell the story , her facts are not drawn from the hip. The tow companies go unchecked in Norwalk the storage lots are filled with cars from all over the city the police log shows the work . With so much places to park in the city why are so many towed from wall st if the lots are half full? The Norwalk parking authority has many things to do making sure parking for Wall st is not one of them .But the NPA does take care of gold cart parking and have rules if that helps any on wall st. Disbanding the parking authority has come up often I have to ask why? Common Council approve the nearly $7 million spending plan — up 3.75 percent from spending approved for fiscal year 2018. Too bad parking was not a priority we pay so much to keep it in business for that kind of money we all should get time in a parking garage once in while for nothing. but back to Non what part of this article says Nancy has not covered Norwalks construction in all parts of the city? I submit evidence package number one. Learning the history of Norwalk is not just for kids. Garden Cinema has probably been strictly a labor-of-love for its owner for years. Having endured severe disruption first wrought by the internet and more recently by the Tyvek building, this man deserves a big vote of thanks. If he sells the place, we can still attend occasional amateur shows or tribute-band concerts at the $10 mil. state-funded refurbished Globe. he must have that parking lot I use when i go to that forgotten place that does nothing but advance the quality of life and health on Isac street. Shame on him for letting a building full of volunteers make Norwalk a caring city by the work they do. what has city hall done for the Treasure house? Im sure that house was bought by a city connection also what a shame it was such a nice place until Rilling became Mayor along with sidekick Ms X. Some shopped there daily for free parking now i doubt if west ave will provide free parking like that hooligan Milligan did. death of another local historic home how nice it was before the election. “nay sayers and conspiracy theorists and mayor haters and progress repressors”—Hollow juvenile schoolyard taunts. “caught up in the Wall St mess, or complaining about malls or apartments”—The RDA proposal calls for more apartments to be built in the Wall St area. That is what is being debated. “is it because they only care about one section of Norwalk, where their financial interest lie?”—Who is this “they”?Every taxpayer has a financial interest in how their tax payments are used. Again, the proposal at hand concerns spending money in the Wall St. area. “fear mongers…lazy, disconnected and tending to complain if we can’t park at the door to where we are going… waaaaaa really people. Let’s grow up”—In attempting to ridicule others, you ridicule yourself. This from a New York Times article in 1987. “WHEN Brian Fox converted what had been a pornographic movie theater into an art cinema in 1979, not many people thought he would succeed because of the location – on Washington Street in South Norwalk. “The large restoration project near the Norwalk waterfront, intended to turn much of the Washington Street area into a tourist attraction, had not yet begun.